At this point, hopefully you've learned what spinners to use, when to fish and where you need to cast your lure. But once your spinner is in the water how can you maximize your chances to entice a strike from a hungry trout? The first task comes in getting the lure as close to the fish as possible. Living in flowing water requires a constant use of energy by these fish and they don't want to use any more energy than necessary to chase after a meal. Your best odds are if you can get the lure within a foot or two of the fish. Bear in mind that this includes vertical distance, so if you're fishing a hole you're going to want to make sure your spinner sinks deep enough before retrieving it. Now that you've got the spinner near a fish, how do draw a strike? The most basic rule is to retrieve the spinner as fast as you can. That way the trout don't have time to think about what they're about to bite down on and the extra speed will give you lots of action with the spinner blade creating vibrations in the water that will send signals to hungry trout that a panicked baitfish or crawdad is in the vicinity. This is where it's really nice to have a shaft-in-blade lure like those made by Panther Martin. Unlike normal spinners whose blade is attached to the shaft with a tiny bracket, shaft-in-blade lures will naturally travel deeper upon retrieval. Any lure is going to travel closer to the surface as you increase the retrieval speed, but a Panther Martin will not skim along the surface like a Rooster Tail or Mepps. If you find that a straight, fast retrieval isn't working there's another thing you can do to entice a strike: slow it down. Not for the entire retrieval, just momentarily every five to ten feet. Remember, trout don't want to move far or work too hard for their meal. A trout might not take the energy to follow your lure for long if it is just buzzing right by. Slowing your retrieval down for a just a few seconds will give the trout an opportunity to catch up and strike at the lure. It will also give your lure a chance to sink and if you're fishing a deeper hole, that might just give a trout that would have certainly passed on a fast moving lure near the surface a chance to strike. One last trick you will want to consider is to make the lure change directions. This is accomplished by simply moving your rod from one side of your body to another. A straight-line retrieval might give a trout the indication that what they're looking at isn't natural and potentially unsavory. Changing direction is something the trout's normal prey would do while trying to evade a predator and might lead a trout to believe that your spinner is something good to eat. 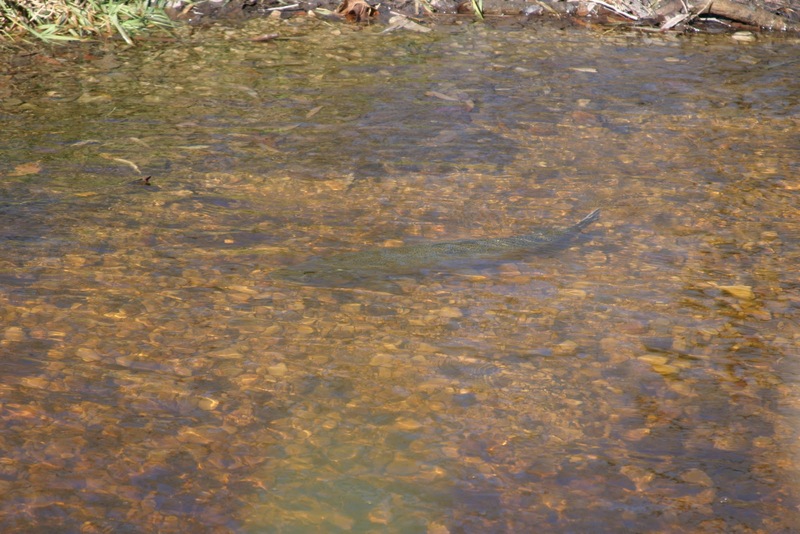 Trout can be wary fish, so knowing how to entice as strike is essential to ensure consistent success at the stream. Keeping the lure near the fish, retrieving quickly (but with speed changes) and regular directional changes will increase your chances of catching your limit in a trout stream.